Wear over limited-edition† Into the Garden™ Nail Lacquer. Limited-edition† Into the Garden™ Nail Appliqués embrace the season’s floral sensation. The pretty floral and lace designs take their cues from spring blooms and ladylike detailing. 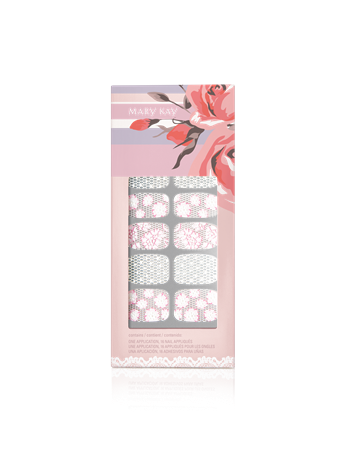 Nail appliqués are part of the limited-edition† Into the Garden™ Collection – designed through the exclusive collaboration between Mary Kay Inc., Brazilian fashion designer Patricia Bonaldi and Mary Kay Global Makeup Artist Sebastian Correa. Peel off an appliqué that matches the width of your nail, and smooth across nail surface. Using a nail file or emery board, file the appliqué downward along your nail tip to remove excess appliqué length. Can be worn with or without a base coat. Gently peel appliqué from nail starting from the side corner of the cuticle area. Remove any residue with non-acetone nail polish remover.